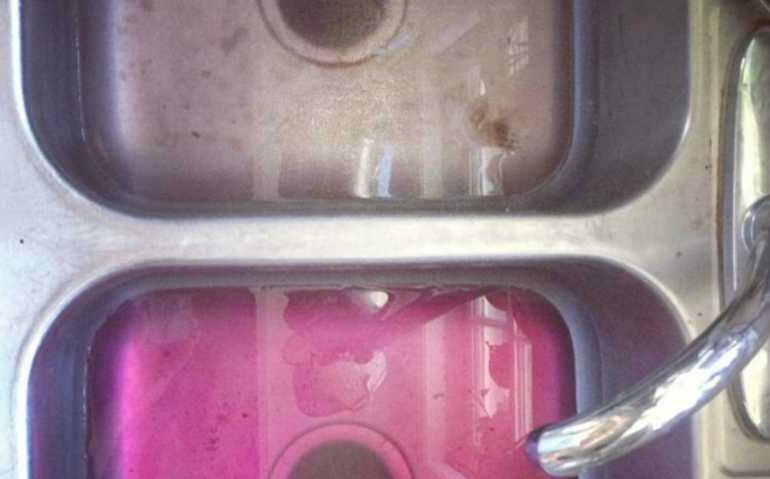 When your garbage disposal stinks, it’s a real problem. Not only does it make living in your home an unpleasant experience, when your garbage disposal smells, it means that there’s something wrong with your system. So, how do you get rid of that garbage disposal smell? There are several reasons why your garbage disposal smells but pinpointing the problem can be a little difficult if you don’t know what you’re doing. By following the easy steps below, you’ll be able to identify the issue and properly fix it. You don’t have to be a professional, but you will need a few tools. So, let’s get started. Before you begin taking apart your garbage disposal to eliminate that foul odor, you’ll want to try this simple remedy first. If it works, you’ll save yourself time. 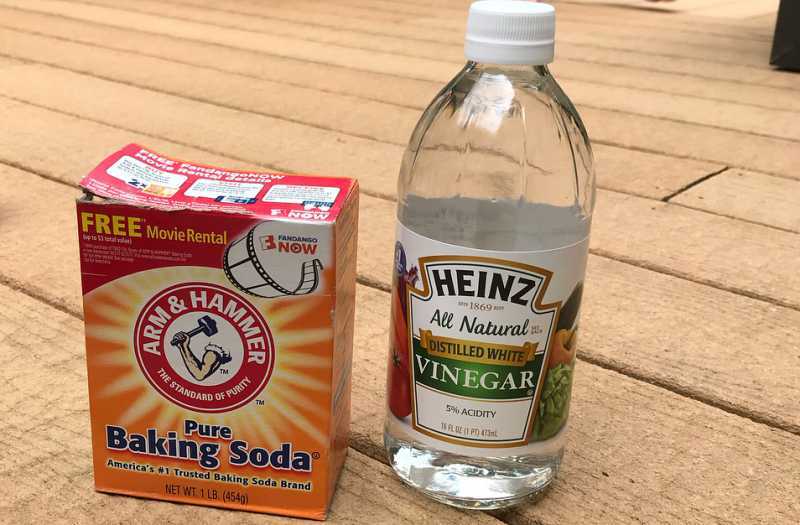 For this simple remedy, you’ll need one cup of baking soda and one cup of vinegar. First, pour 2 cups of baking soda down your garbage disposal and then slowly pour ½ cup of white vinegar down after it. When these two substances are mixed, they’ll start to form a bubbly mixture. You’ll want to give the baking soda and vinegar about 10 minutes to clean your garbage disposal. While you are waiting, spend this time boiling some hot water in either an easy-to-hold pot or kettle. After the 10-minute waiting period is up, pour the boiling water down the drain. This will wash out the white vinegar and the baking soda. Once you have done this, you’ll want to pour two cups of ice down the drain along with one cup of salt. Now, turn on the cold water and run your garbage disposal. Run the facet and your disposal until the ice is completely gone. By doing this process, you’ll remove all the grime and other filth off the blades of your disposal. If you find that your garbage disposal still stinks, take either orange, lemon, or grapefruit rinds and one by one, drop them into the drain. You’ll then want to turn on your garbage disposal, grind them up, turn on the facet, and let hot water wash the particles down. This method will also give your kitchen area a lovely citrus smell too. The procedures listed here should be completed at least once a week to keep your garbage disposal smelling fresh and clean. For maximum effectiveness, use both methods described above on a regular basis. If your garbage disposal still has a foul odor coming from it, there may be a more serious problem at hand. More than likely, the problem could be that you need to clean the splash guard or completely replace it. Cleaning and replacing your splash guard is a pretty easy task. If you’re unfamiliar with what the splash guard is, it’s the rubber flaps in the drain. These rubber flaps help prevent food and other waste from flying up through the drain and onto the sink when you run your garbage disposal. Essentially, the splash guard helps keep your sink clean. The first step is to clean your splash guard to see if this is the problem. Cleaning the underside of your splash guard is less expensive and not as much of a hassle than replacing it. To clean the splash guard, you’ll need an old toothbrush and some degreasing cleaner. You can find this degreasing household cleaner at most stores. Make sure to turn off your garbage disposal before starting any maintenance. 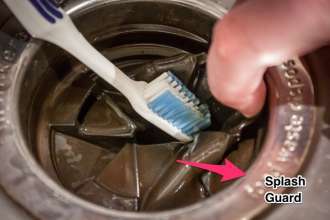 First, pour about ½ cup of your degreasing cleaner into a cup and dip your toothbrush into the solution. If you have a spray bottle, simply spray some of the degreaser onto your toothbrush. You’ll now want to lift up the flaps of the splash guard and begin to clean the underside of the splash guard. After a few strokes, dip the toothbrush back into the degreaser and repeat this process until the underside of the splash guard is fully cleaned. When you’re finished, you should then turn on the facet and rinse the splash guard off with cold water. Now that you’ve cleaned your splash guard, your kitchen should stop stinking. However, if you find that your splash guard is torn, broken, or simply worn out, then you’ll want to go ahead and fix it. To complete this job, you’ll need a new splash guard and your 4-in-one screwdriver. You can buy a new splash guard at most home improvement stores for around $10 to $15. Once you have completed this, use your screwdriver to push the tip of it into the locking ring. Once you have pushed the tip of your screwdriver in, you’ll now want to rotate it away from you. As you do this, the garbage disposal will drop. You can either have another person catch it, or you can place a stack of books underneath it. The stack of books will catch it; however, if you choose this method, you’ll want to make sure you balance the garbage disposal when it falls, so it doesn’t roll of the books and break. 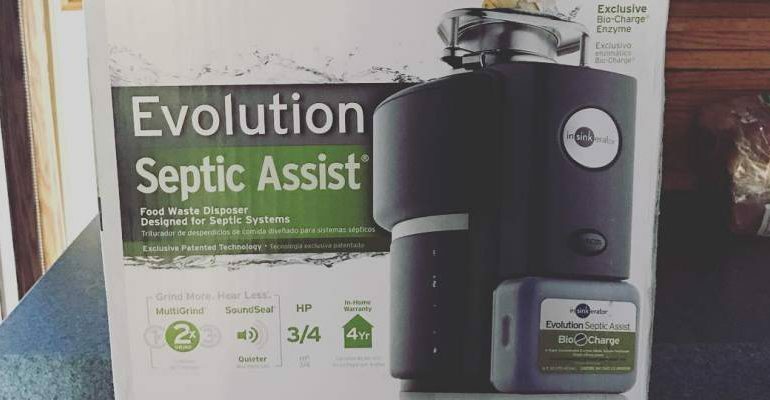 Some garbage disposals are hardwired, and if your kitchen has one of these, the process of removing the garbage disposal will be a little different. Start by disconnecting the garbage disposal and turning off the electricity in your home. This will prevent any unnecessary accidents. Now, you’ll want to remove the drainpipe in addition to the quick-connect fitting. Once you have these removed, then you can then remove the garbage disposal like described above. Grab the old splash guard with both hands and pull it off the garbage disposal. Take your new splash guard and firmly press in onto where you took the old one off. Make sure that the new splash guard is completely on. You’ll want to press down onto it in all areas. Once you have successfully put the new splash guard back on, put a few more books on the stack. You’ll want to put as many books as needed until the locking ring on the unit itself is in direct contact with the sink flange. Take your 4-in-1 screwdriver and rotate the ring towards you to lock it into place. You can now reconnect the drain line, turn the power back on, and plug the garbage disposal back in. 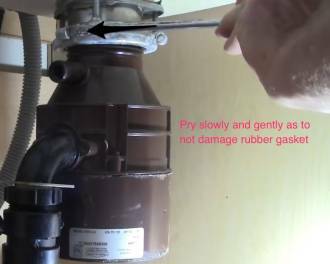 Replacing the splash guard is actually a really simple job, even for people with little or no home improvement skills at all. The most difficult aspect to the job is holding the garbage disposal up and making sure it doesn’t roll off the stack of books. This is why it’s helpful to have a second set of hands. 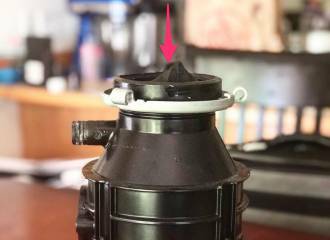 If after replacing the splash guard you’re still smelling a bad odor, don’t get lose hope. The problem could be the stopper. Overtime, the rubberized stopper can become worn down and begin to absorb odors than will not come out. A quality stopper will effectively create an air tight seal which guards from nasty odors that result from grinding up food waste. It’s important to note that on some garbage disposal units, the splash guard and the stopper are one piece. However, if they’re not, then proceed with the following steps. First, you’ll want to remove the old stopper. You’ll need a pair of adjustable plyers, a 4-in-1 screwdriver, and plumber’s putty do this. Start by disconnecting the drain trap. Next, take your 4-in-1 screwdriver and disconnect your garbage disposal as described above and use a stack of books to catch your unit as well. 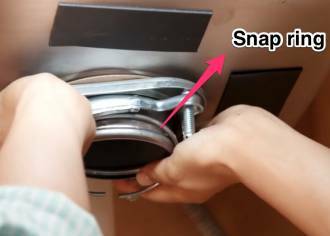 Once you have disconnected the garbage disposal, use your 4-in-1 screwdriver to pull off the snap ring that’s located on the stopper itself. Take an average of about 4 oz. of your plumber’s putty and form it into a rope-like shape. It should be about ¾ inches in length. What you’ll want to do with this putty is form it around the total area of the sink hole. The idea here is to seal the sink stopper. Now, push the replacement stopped firmly down onto the sink hole. You’ll now want to put everything back together just like you took it apart. Make sure all your screws are tight, and then once everything is back together, run your facet to make sure there are not leaks. It’s recommended that you check your stopper when you replace your splash guard. This will eliminate the need to take everything apart two times instead of one. If after you’ve done everything described above you still have a foul odor, the problem is more than likely coming from the inside of your pipes. In this case, there are many things you can try. One of the most effective is using a plumber’s snake to break down some of the grime that has built up on the inside. If you use this method, make sure you turn on the facet and run hot water after you’re done. This will wash down any loose materials the may have became loose.